My suspicion of the moe fetish in all its manifestations is now pretty evident if you’re one of my regular readers, though of course as an anime fan trying to keep up with the latest stuff, I’ve developed enough of a thick skin to tolerate its less obnoxious forms and even applaud shows that manage to do some things right, like Clannad. Someone who was writing for Seto no Hanayome, though, must have thought: is there a way we can render all this stuff as ridiculously as possible while still keeping our core otaku audience entertained? To simultaneously mock and pander to the fanboys? Doubtlessly after many bottles of alcohol and grams of cocaine, the thought entered the mind: why don’t we make the two most masculine characters in the series–Gozaburo Seto and The Terminator–moe? Top that, Key! The result is so repulsive–and so hilarious–that it easily makes any top list for memorable moments from 2007. It’s not just the Arnold wannabe spouting lines from harem comedies and eroges and shouting “KYAAA!” when he’s seen changing. 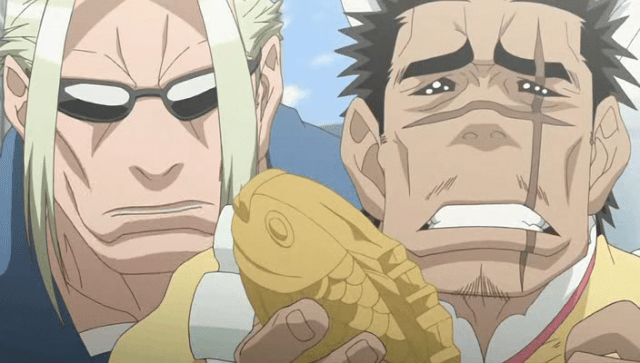 It’s not just a yakuza boss holding a taiyaki and actually saying “uguu!” No, as embarassing as such depredations are to their daughters, the most hilarious thing about it is their motivation: they actually believe they can understand their daughters better by becoming the otaku fantasy of the teenage girl. Clearly, coming from the future has not made The Terminator more tech-saavy, for it all began with an errant Google search for “teenage girls.” A Google Japan search, mind you. He should have known better what the results of that research would turn up. What’s also being satirized is the whole idea of the dating sim, that it somehow replicates real relationships at any realistic level. For tough guys they sure are naive. It takes the mother to remind them that they are supposed to be men, not moe moe. But this, of course, would have seemed just nasty and mean to the fanbase if we didn’t get our cake too. A little neko mimi mode and we are back to the reassuring tropes: the embarrassment, the megaton punch, the drooling teenage boy following around the catgirl. But the damage has been done. The images of a yakuza boss will forever be superimposed on the memory of Ayu and the imouto who wakes up onii-chan will always have an afro and a goatee. The goggles, they do nothing! In the name of Key and Kyoto Animation, cleanse us! Previous Post12 Days, 12 Moments: Day 1–Hayate vs SantaNext PostMy Anime List: Have You Seen What I’ve Seen? Best single episode of all time… of course you have to watch the previous 19 episodes for this to have the punch that it does….but what a punch it is… also this series has the best ending ever….